North Korea announced today (March 16) that it intends to loft an Earth-observing satellite to orbit between April 12 and April 16. The move is drawing condemnation from officials in the United States and South Korea, who suspect the launch is mere cover for military missile testing. The stakes are high, particularly since North Korea possesses nuclear weapons and is famously erratic in word and deed. But the West remains unsure just how serious the country is about scientific spaceflight — and how advanced its technology may be. North Korea is a communist state founded by Kim il-Sung in 1948. His son Kim Jong-il took over upon Kim il-Sung's death in 1994; when Kim Jong-il died this past December, his own son Kim Jong-un took the reins of the isolated, impoverished Asian country. April's satellite launch attempt, which is timed to celebrate the centenary of Kim il-Sung's birth, won't be the first for North Korea. The country claims to have successfully orbited two experimental satellites, one in 1998 and another in 2009. According to North Korean officials, the spacecraft are currently zipping around Earth broadcasting praise of Kim il-Sung and Kim Jong-il into space. Western observers, however, say these previous launches failed. "They haven't succeeded yet," Weeden told SPACE.com. "No one has ever tracked anything in orbit from one of these launches yet." Still, the repeated attempts show an interest in developing a space program. And some signs recently have pointed to an effort to do things responsibly — or at least in a manner that wouldn't draw so much fire from the West. "The North Koreans have been making some of the right noises in doing a quote-unquote responsible space launch," Weeden said. "In the last one, in 2009, they did pre-launch notifications. They posted — here's the splash-down zones where the rocket stages land, as warnings to mariners and airmen. That's a standard thing you do." Such steps, however, likely won't carry much weight with North Korea's critics, who can cite the country's many broken promises and abrupt reversals of course. Just two weeks ago, for example, Kim Jong-un brokered a deal with the United States to halt long-range launches in return for 240,000 metric tons of food aid. That deal is almost certainly off now, experts say. Even if North Korea is genuinely interested in establishing a scientific space program — and if that's the primary purpose of next month's launch — Western worries are only likely to increase. 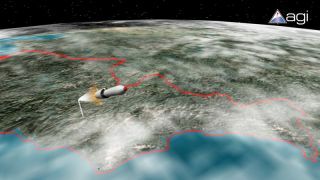 "The concern, of course, is that whatever you learn from your space launches can be used to help improve your ballistic missiles," Weeden said. So the United States, South Korea, Japan and other countries will be anxious to see how April's launch — which will use a new rocket called Unha-3 — will go. "Who knows? Maybe they'll pull it off," Weeden said. "But I wouldn't hold my breath."